Here’s a relatively quick recipe that serves as a light lunch or as a main dish with a salad on the side. The most difficult part of this recipe? Making the toast cups. I always have a fight when I try to press a piece of square bread into a round muffin tin. If anyone has a technique to end my suffering please let me know. I find that pinching the sides together seems to work. Kind of… But the end result makes “all that stress” worthwhile. You can serve on buttered flat toast, but it’s not as dramatic. There are many variations of “Newburg” with different seafood ingredients. 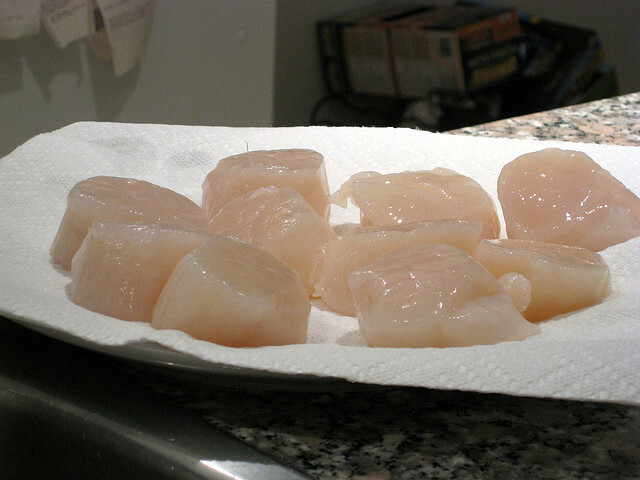 The most common are scallops, shrimp and lobster. 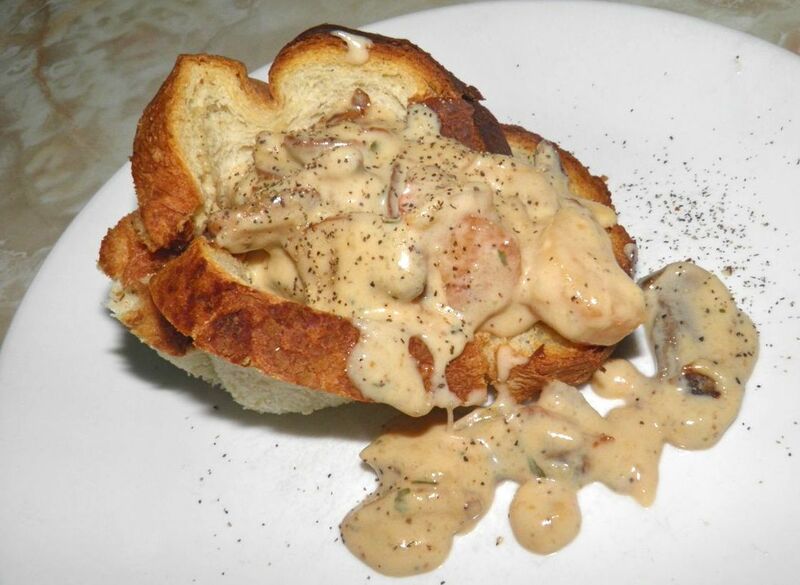 Lobster Newburg first appeared at Delmonico’s in New York in the 1870s. Its was among the most popular dishes served in the American Pavilion at the Paris Exposition of 1900 and the Columbian Exposition in Chicago 1893. There are several versions of how the dish got its name. Most agree on two important points: the restaurant that made this dish famous was Delmonico's in New York, and it was named for Ben Wenberg. It appeared on Delmonico’s menu as Lobster a la Wenberg. The story of how the name changed from "Wenberg" to "Newburg" is fuzzy. One story has that Mr. Delmonico and Mr. Wenberg had a bit of a falling out. In a fit of pique Mr. Delmonico wanted it removed from the menu, but it was so popular he couldn’t. So he switched the first three letters from “Wen” to “New” and Newburg was born. Another story has the argument, but from Mr. Wenburg’s side. He didn't want his name used with it. But who in their right mind would not want their name associated with a recipe so delicious? I tend to agree with the first name actually. This is a good way to prepare lobster, or shrimp, or scallops. The originals never had onion or mushrooms. Those are my additions and help stretch a little scallop meat into enough to feed four. There’s something about the richness of seafood that pairs beautifully with cream, cayenne and liquor. I have written “optional” by the cognac, but you really should include it. If like most of us you seem to be out of cognac, a perfectly acceptable alternative is either brandy or vermouth. Delicious either in toast cups or plain toast, with a side salad or not, this recipe takes very little effort to bring together. 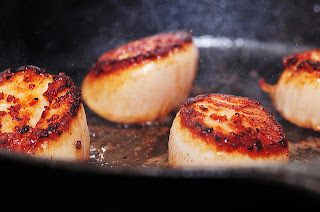 I’m sure if your family likes scallops they’ll love them served this way! So many people don't know how to cook scallops. Heat one tablespoon of butter in a sauté pan. Once hot, add the scallops. Do not crowd them in the pan. Sprinkle with salt and pepper and let sear on one side. Then turn – only once – and repeat on the other side. A little on the raw side is best. Remove the scallops to a pan, and if the scallops are large either quarter or halve them. Add the remaining butter to the pan. Add the mushrooms and onion and let cook until the mushrooms begin to brown. Add the flour and mix in well. Then slowly add the milk. Stir until the mixture has thickened. Then add the pepper, cayenne and tarragon. Add the scallops and cognac and let cook long enough to just heat through. Divide the Newburg between the eight cups. Serve with a simple green salad if you wish.